The World Health Organization (WHO) Regional Office for Africa recently reported updated meningitis numbers for the countries of the African Meningitis Belt and surrounding areas. For the first three months of 2018, 7,403 suspect and confirmed cases were reported, including 566 deaths for a case fatality rate of 7.6 percent. A total of 2,904 samples were tested out of 7,403 cumulative suspected cases and half of the samples that tested positive were identified as Streptococcus pneumoniae, while another 36 percent of cases were identified as Neisseria meningitis with serogroup C (14.2%) being the most common. The Democratic Republic of the Congo reported the most meningitis cases for the period with 2,090 and 179 deaths, followed by Nigeria (1,804/119) and Burkina Faso (869/59). 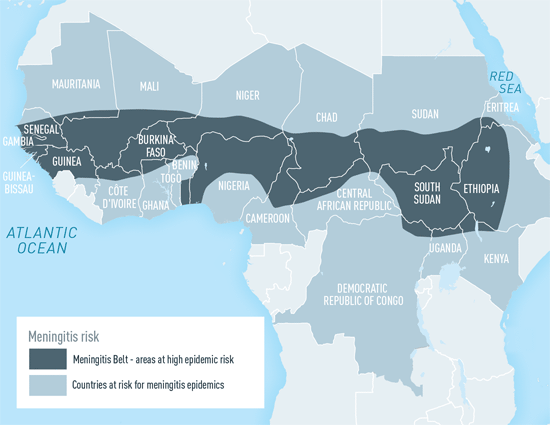 The countries of the African Meningitis Belt face outbreaks of the deadly bacterial disease every year. According to WHO, Meningococcus is transmitted by aerosol or direct contact with respiratory secretions of patients or healthy human carriers. As a rule, endemic disease occurs primarily in children and adolescents, with highest attack rates in infants aged 3-12 months, whereas in epidemics older children and young adults may be more involved. Nasopharyngeal carriage of meningococci is most common among adolescents and young adults, less so among young children and relatively rare in adult populations. Transient nasopharyngeal carriage rather than disease is the normal outcome of meningococcal colonization. However, the rapid progression of meningococcal disease frequently results in death within 1-2 days after onset. 5-15% of children and young adults carry meningococci in the nose and throat, so chemoprophylaxis is of little value for the control of most endemic and epidemic disease. Immunization is the only rational approach to the control of meningococcal disease.